This rifle from Beeman is a unique design which incorporates not one, but two rifled steel barrels which can fire either both pellets at the same time, or one at a time. The firing option is selected through a easy to use knob to direct the flow of air from the spring and piston system. This model has one .177 barrel, and one .22 barrel, so don't forget to pick up a tin of each calibre pellets! The rifle is cocked through the traditional break barrel system, whereupon the two barrel which are stacked on top of each other, pivot downwards from the breech. The spring and piston action is smooth and sweet to shoot, and the two stage trigger has a crisp and clean release on each shot. 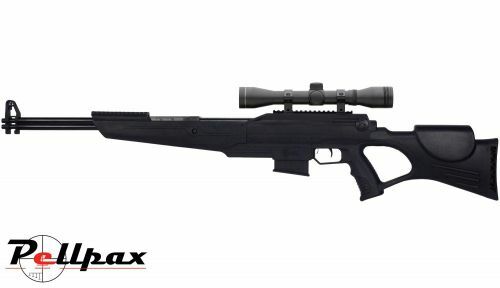 This model of the rifle is fitted with a synthetic stock which has a raised, ambidextrous cheekpiece, a thumbhole grip design, multiple weaver rails incorporated and a fake magazine to give the rifle a 'Tactical' look and appearance. The rifle comes complete with a 4x32 scope and mounts as well so you can be shooting on target as soon as it is delivered to your door! Add this item to your basket & spend an extra £220.01 to apply for finance.